Do you cook to music at all? I very often leave the radio on to hum in the background and catch a couple of notes in between the sizzling and bubbling, although I am a notoriously bad singer. Writing about ntolmadakia, soutzoukakia, youvarlakia and the refugees from Asia Minor for my previous posts, I remembered rebetiko, the music they brought with them. 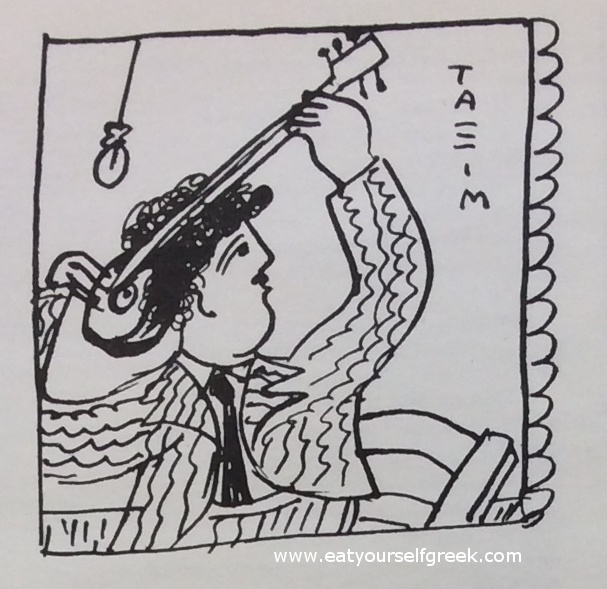 You are perhaps mildly acquainted with some of the songs, as they are often the soundtrack to your meals in little tavernas all over Greece and elsewhere. Characterised as Greek blues, rebetiko’s stripped down sound and subversive lyrics set it apart from other Greek music. Bringing together a range of influences including Turkish, Roma, Balkan and Greek tunes and instruments, rebetiko coalesced around little cafes where handfuls of passing musicians would come to play and sing, often improvising songs before making their way again. Various dance styles also grew up alongside the music, with zebekiko and hasapiko being prevalent. It was very much a male affair around the turn of the century, and a counter-culture rather than family entertainment. No specific artist or city can lay claim to the first sparks of this movement. In 1900’s Greece, rebetiko is performed across many urban centres and large, busy ports like Thessaloniki and Peiraeus. With the population exchanges of 1922, an enormous wave of migrants settle in Peiraeus. As best they can at least. The hardships seem insurmountable as almost 1.5 million refuges jostle for shelter in a poor, unstable and wholly unprepared Greece. As poor urban dwellers adjust to their new lives in port slums and cities, rebetiko establishes itself and becomes an identity. As the refugees settled in Peiraeus there was much to lament: a lost country, separated families, unemployment, the harshness of their new lives and, in a world where so many resorted to dishonourable means just to survive, crime. With its melancholic and slow melodies, rebetiko was possibly the first music to celebrate crime above life. The lyrics are factual, uniquely teasing, satirical, and irreverent. So much so that even death is mocked. “Sung by simple people for simple people” as Elias Petropoulos put it, rebetiko spreads underground, developing its very own slang as the authorities attempt to suppress dissenting voices bubbling up from the largely criminalised underclasses. Unless you are a thief or seasoned port worker, you would have no clue what these people were singing about. Such music is also associated with cannabis. But smoking is banned in the 1890’s, although the law isn’t seriously enforced until 1923. By this time, the once ubiquitous hash dens and cafes around the port, are forced to conform. They go underground, taking rebetiko with them. And it gets even more interesting, prison songs emerge; sung not just about prison by ex-inmates, but within prisons too. Prisoners would hollow marrows and string them with wires to make baglamadakia. In the 1900’s most of the rebetiko recording were done in the USA and Turkey. Greece is hesitant as the themes of crime meet government disapproval and censorship, but gradually, indigenous recordings are allowed with slightly modified lyrics to please all ears. In the 1930’s the scene has pretty much matured, and there are some exceptional voices. Among them, the likes of: Rosa Eskenazi, Marika Papagika, Rita Ampatzi, Marika Ninou. This is by Marika Papagika. The music has become more polished, it’s no longer improvised, instead of one or two musicians, there are bands comprising four or five members. The sounds change subtly too, with bouzouki and baglamas coming to the fore, getting a more distinct role, as the oud and zither are slowly left behind. Amidst this reinvention Markos Vamvakaris, from Syros, comes to Peiraeus as a kid, smuggled in a boat to look for work. Nobody would have guessed his talent. Falling in love with the music, he masters the bouzouki in six months and his lyrics are still sung to this day. During WWII, rebetiko continues to produce wonderful music and also enjoys much broader appeal. It’s songs support a national struggle, and as the musicians leave their bouzoukia behind to go to the front the music could not be closer to the hearts of the people. With the end of both WWII and the civil war in 1949 – an opening salvo in the Cold War enveloping Europe – rebetiko changes substantially. Having adapted to pre-war censorship, there are no songs of pot-smoking or anything remotely marginalised. Musicians still sing about daily hardship, but their lyrics also dwell a little more on love. Two great musicians take it to the next level, Vassilis Tsitsanis and Manolis Chiotis, each in his own way. Tsitsanis, named by many as the father of rebetiko, gives the music a much broader appeal, working with one of the greatest Greek singers, Sotiria Bellou. Chiotis, in the rebetiko music scene since the pre-war years, changes its sound as well. He alters the bouzouki, upgrading it from three to four-course, providing him with the means to play much faster melodies. Rebetiko starts to form as a new genre, it has become pop music, what we call laiko. Both sound and lyrics have a different quality, with the bouzouki out in front. Chiotis is, of course, a great bouzouki soloist. So these are the songs you normally hear in Greek tavernas. 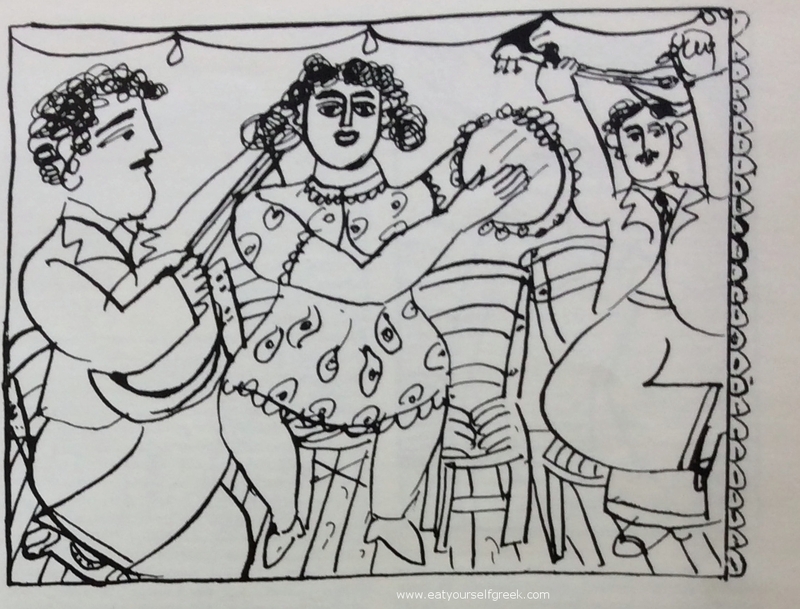 Sorry, there is no food in this post, but in the good old days of rebetika, people used to simply drink wine, enjoy the music and forget for a while their daily struggle. In case I got you excited about the music, which I hope I did, there is a great film covering the topic with a very straight forward title: Rebetiko, by Costas Ferris & Sotiria Leonardou.